My artistic abilities are comical. Seriously, Stampy came home from work and was crying from laughter looking at my latest “craft” I attempted with the kids. And like all of my artistic endeavors, he had to ask multiple times for verification that my project was in fact what I said it was. Tonight it was a Rudolph head made from felt. It all started because I ordered 17 pounds of felt, so I thought I should do something with it. Seriously, why did I order so much?? 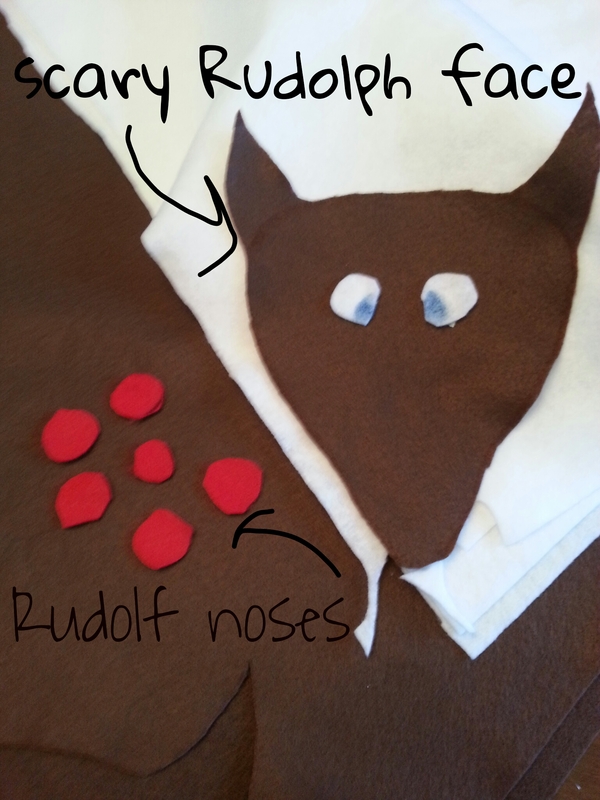 So after I cut out a triangle to make a Christmas tree and about a dozen ornaments, I came up with the brilliant idea to make a Rudolph head and red noses so the kids could play “Pin The Nose On The Reindeer”. Now, I don’t get creative ideas too often so I tend to run with them even when I realize that I have absolutely zero artistic ability to actually carry out the idea. Ignoring that fact I proceeded to make the most satanic goat-deer for my kids to play with. After screaming “monster” and running and hiding, the kids actually played the game for 5 minutes. I consider that a success. In case you would like to make one yourself (I actually feel like this could be a fun game for kids) I will give you instructions. 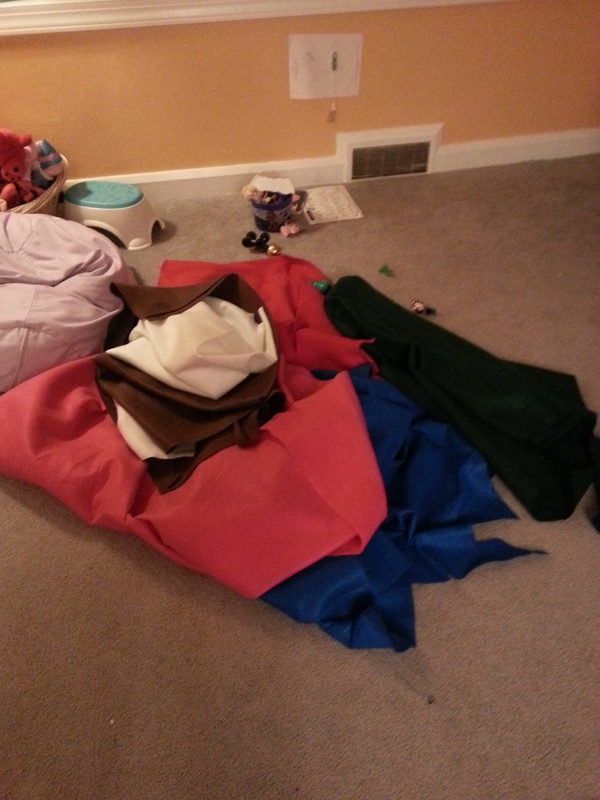 To start the process, you need brown, red and white felt. I cut out 6 red noses, but that is completely optional. Draw and cut your own animal head. The less it actually looks like a reindeer the better. Then 2 white eyes, I suggest using a marker to give some color to the eyes to tame down the nightmares, but that’s a personal call. 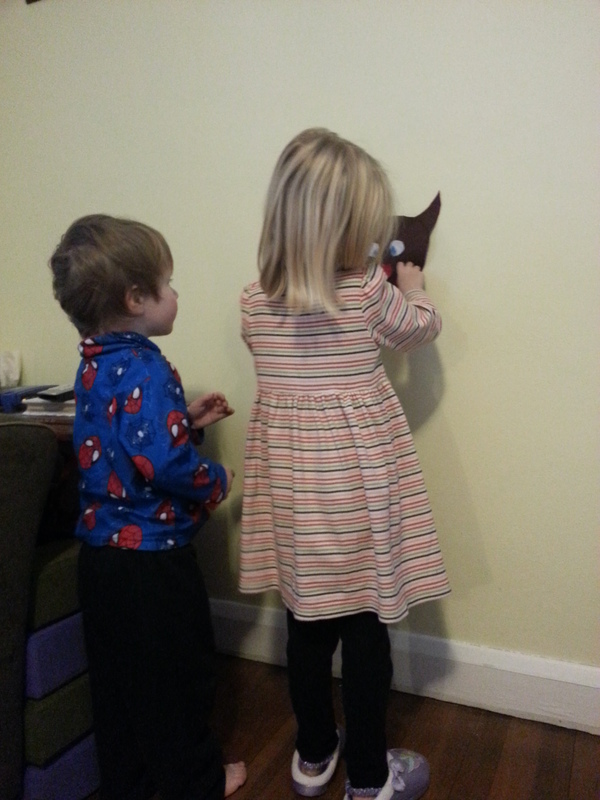 Once that is done, you can hang on a wall and let the kids have at it. I managed to get each child to close their eyes for about 5 seconds while placing the noses on. I couldn’t tell if they just didn’t get the premise of the game or didn’t want to take their eyes off the demon hanging on our all, lest it attack them. Everyone survived. We will be having a cleansing after the Christmas season to rid our house of evil spirits. I would love to see your crafts. It would give me inspiration. Good luck. I’m not sure I would inspire, but I will make you laugh! Oooooo, that’s funny. Anyway i keep trying. I’ll think of you. Nothing wrong with that. Just keep at it.